Well… it’s not every day that you come back from a predawn dogwalk to find three FBI vehicles that weren’t there when you left suddenly double-parked and left unattended in front or your house. The even bigger unanswered mysteries were why they were there and for whom of my neighbors they were interested in, but for the duration of the even the agents were nowhere to be seen or found, and when I glanced out the window the trio of Fords (two Fusions and a later-model Taurus) was gone without a sound. As if they were never there [cue eerie music]. There is so much post-election noise being generated. Rightfully and at times vibrantly so, but it can be disheartening because while the democrats nurse their wounds and talk about “listening” to the voters and the republicans trumpet their collective victory as a mandate for change, it’s just sounds like so much hooey. Which leaves me feeling pretty glum and exhausted by and about it all. And on this the day after I got on a plane and flew to San Antonio for a business trip. 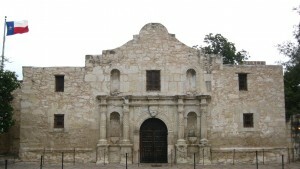 Around the corner from my hotel is a little place called The Alamo — a literal shrine to heroes and to liberty. And on that hallowed ground is a plaque featuring a letter from the post’s commander William B Travis. It was a call to arms and a plea for support and assistance, and a defiant refusal to surrender. Fellow citizens & compatriots I am besieged, by a thousand or more of the Mexicans under Santa Anna. I have sustained a continual Bombardment & cannonade for 24 hours & have not lost a man. The enemy has demanded a Surrender at discretion, otherwise, the garrison are to be put to the sword, if the fort is taken I have answered the demand with a cannon shot, & our flag still waves proudly from the wall. I shall never Surrender or retreat. When it was announced that LAPD Chief Charles Beck was to be in attendance at this week’s City Council Transportation Committee meeting Wednesday, I would have bet good money that he wouldn’t show. Nothing against Beck, it’s just that in the recent past there have been blow-offs by the department to requests by the committee for reports and presentations, so it wouldn’t surprise me if its chief suddenly found something more productive to do than placate a passel of cycling types. Then I heard that that Carmen Trutanich’s office had declined to file charges against the suspect who struck cyclist Ed Magos on January 6 and then, after getting out and observing a seriously injured Magos on the ground pleading for help, got back in her Porsche Cayenne and left the scene. This absolution against someone so criminally culpable and morally bankrupt compounded the frustration I was already feeling when I’d heard that the suspect later turned herself in to police telling them that “I may have hit something,” only to have the police for all intents and purposes condone such reprehensible behavior by sending her on her way instead of arresting her for felony hit and run. Then at noon I pedaled over to Heliotrope and Melrose in East Hollywood to meet up with a group of cyclists organized by the L.A. County Bike Coalition who were heading to City Hall and the committee meeting via the route that Magos took the day he got hit. One of the items on my agenda as an Angeleno has been to visit City Council chambers, but never in my wildest dreams did I think I’d ever task myself with speaking there. But despite how much I hate doing so, I knew I had to do more than represent physically. For better or worse I had to verbalize it as well. But a funny thing happened on the way to the lectern mic with all the bombast I’d been planning to drop. Beck took the wind totally out of my sails by addressing the Magos incident specifically in his opening statement at the beginning of the meeting. He said he recognized that the ball got dropped and that people were pissed and as such had spoken with Trutanich’s office, which had agreed to take another look at the issue (whatever that means). In the wake of the recent uptick in citations being issued to cyclists on unregistered bikes, my Giant OCR roadie is now legal. After work yesterday I rode it over to LAPD Central Division on 6th Street and Maple in the heart of downtown’s skid row — the only police station* in the entire city that issues bike licenses — and after presenting my ID and completing a short form, I was presented with the two stickers shown above, the blue/silver license and the yellow/white renewal sticker. What’s extra special is that the license expires at the end of 2010, at which time renewal for another 2-year period is required. I didn’t even bother to ask why the license expires. “No, you have to come back and renew in person,” I was told. Lovely. Bureaucratically paleolithic, counter productive and patently ridiculous, but lovely. And actually I’ll be back down on skid row in person on Thursday evening to register Le Noir, that is, if my trip to the Bike Kitchen tonight to install the new headset and forks goes successfully. 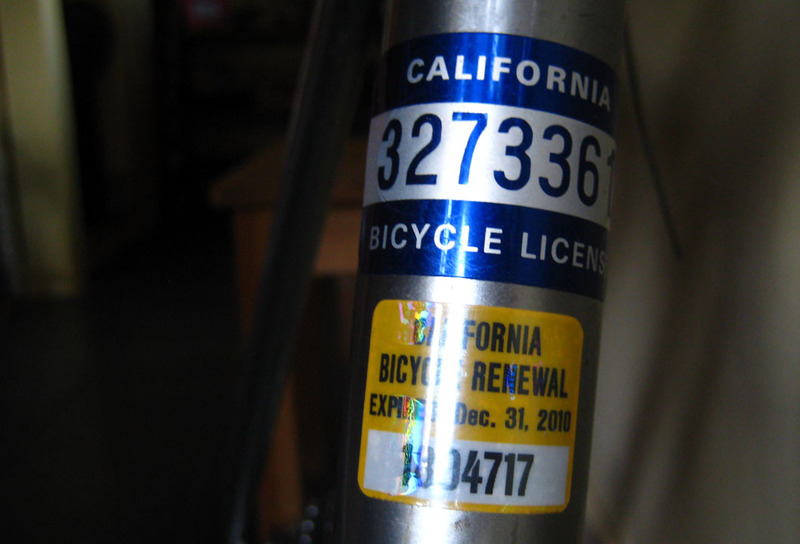 * The only other place bikes can be registered is on the USC campus at the Department of Public Safety office. The university’s Health Sciences Campus near Lincoln Park also hosts a DPS office, but its not clear if bikes can be registered there. About a month ago I probably glazed most eyes over writing about the concerns I have regarding the proposed satellite radio acquisition of XM by its rival Sirius. I won’t bore you again with the specifics other than to say that as a long-time Sirius subscriber I’m still just as wary of the rumors that the individual companies’ existing hardware might not accommodate the combined programming of the new single entity and thus require some sort of cash outlay for a new radio. The vague explanation that remains on the Sirius Merger website coupled to the silence that’s greeted my specific correspondence to Sirius on the topic has served to only increase my apprehension, and prompted me to write my U.S. senators about it. I heard first back from Barbara Boxer whose platitude-loaded form letter pretty much boiled down to “this is an important issue,” and “thanks for writing to me.” Thanks for nothing, Babs. Thank you for writing regarding your support for the proposed merger between Sirius and XM satellite radio. I appreciate your taking the time to share your views. The Department of Justice and the Federal Trade Commission share concurrent jurisdiction over merger enforcement. It is their duty to carefully review, among other things, the potential implication of mergers on consumers and businesses. This is a crucial function of both agencies and it is often a very lengthy process. Although mergers do not require congressional approval, the Senate Judiciary Committee has oversight jurisdiction over mergers and held a hearing last year to consider the implications of the proposed merger. Although I was unable to attend that hearing, I have been following this potential merger closely because, if it takes place, it could have a major effect on the media market in this country. On one hand we would go from a market with two satellite radio companies, competing fiercely to develop their content and attract subscribers, to just one satellite radio company. This could limit the choices available to consumers. On the other hand, I recognize that XM and Sirius have raised concerns that there is the potential for both companies to go out of business if the merger does not go forward, leaving the satellite radio market void. Please be assured that I will keep your support for the merger in mind should the Senate consider these issues further. 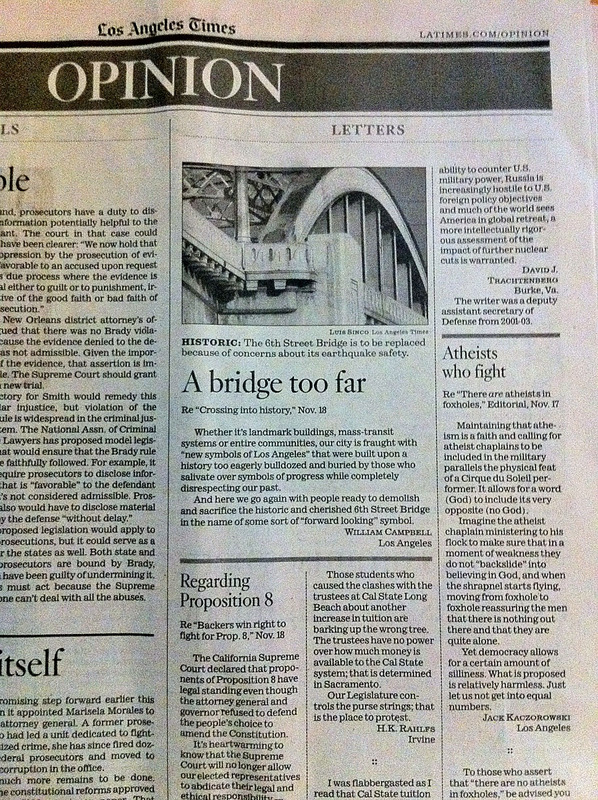 Once again, thank you for writing and I hope you will continue to write to me about issues of importance to you. If I can be of further assistance, please do not hesitate to contact my Washington, DC staff at (202) 224‑3841. Did your staff even READ my letter? I ask this with pointed incredulity because you reference my “support” of the Sirius/XM merger twice in your response when in fact my letter to you expressed the reservations I have regarding the acquisition of XM by Sirius and how it might make current subscribers’ existing equipment obsolete, thus necessitating costly purchases of new hardware in order to take advantage of the new hybrid programming. If you or your staff even bother to read this I only hope it’s clear how absolutely disappointing it is to be so grossly misinterpreted.